Kawal graduated from the University of Southampton (UK) with a Bachelor of Laws (Honours) in July 2014, and was admitted to the roll of Advocates and Solicitors of the Supreme Court of Singapore in August 2016. Thereafter, he joined Tito Isaac & Co LLP in September 2016. Prior to joining us, Kawal completed his legal training at a large-size law firm where he assisted a prominent Senior Counsel in a variety of complex criminal & civil litigation and international arbitration matters. Kawal’s legal practise primarily focuses on Civil and Commercial Litigation where he has led an array of cases at the State Courts and High Court since being admitted to the Singapore Bar. He has also been involved in transactional matters such as drafting and reviewing various corporate agreements and restructuring of corporate entities. Kawal has also been active acting as counsel in international arbitration matters in the area of commercial disputes. Currently he is an Associate Member with the Singapore Institute of Arbitrators. There are a couple of reasons why Kawal chose to practice law, in the area of litigation. First, he enjoys the adversarial concept of Singapore’s legal system. The opportunity to advocate his views and arguments against an opposing lawyer, before a Judge in a courtroom, excites him. The second motivating factor is that he enjoys interacting and building professional relationships with individuals from various professional and cultural backgrounds. It is important to him that in any case, he works very closely with the client. He strongly feels that a client needs to be informed of not only the merits of the case but also the strategy and nuances of the arguments. Kawal feels that practising the law is a calling and his fulfilment comes from the satisfaction he gets when helping clients realise their rights, while respecting the bounds of the law and ethics. Practising the law is Kawal’s second profession as he was a consumer electronics trader for 7 years. He has experience and knowledge about the trading business, particularly in the distribution of consumer electronics products in the African continent. His business and client-care experience bring confidence and calmness to clients and his perseverance and focus assures clients that the best possible outcome, in their cases, will be striven. 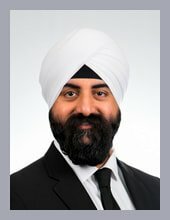 Believing in giving back to society, Kawal has been and still is an active member of the Sikh Community in Singapore. He is currently the Secretary of the Coordinating Council of Sikh Institutions, a council which plays a key role in assisting all local Sikh institutions to coordinate and complement each other. Kawal recently concluded his duties as the President of the Sikh Sewaks Singapore (SSS), a Sikh youth organisation which is committed to identifying key challenges faced by local Sikh youth and implementing sustainable programmes to support them. Kawal is also an active volunteer in grassroots initiatives within the Marine Parade GRC. Obtained summary judgment for a claim worth SGD 1 million in a High Court. Assisted in a SIAC Arbitration involving a transfer of shares dispute worth in excess of USD 6 million. Have obtained final judgments for several clients in District Court cases followed by helping his clients regain their entitlements through successful enforcement proceedings. Successfully obtained orders on behalf of government linked agencies in their claims. Directly assisted a prominent Senior Counsel in the high-profile City Harvest case.